When I made quinoa ladoo, I was told by bloggers and my sister that it was best to soak, dry and roast the quinoa before making anything out of it. Personally, I liked the ladoo the way I had blogged. But, I wanted to make sure I was using the quinoa in the right way. I looked through many blogs, websites and found that roasting was common, but they washed the roasted quinoa and cooked it in some kind of liquid. So I decided to the try out soaking, drying and roasting method. I soaked the quinoa for about an hour, drained the water and dried it on the towel over night. 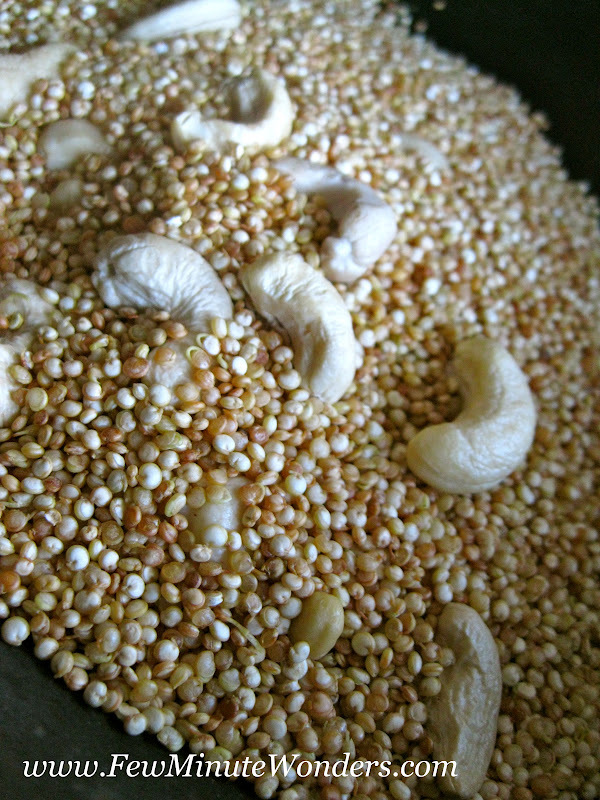 In the morning, I roasted these seeds and here (see below) is the change in size and color of quinoa through the process. The size of the soaked and dried quinoa was big. They however came back to normal size when I roasted them. "the sweet is perfect" . 1. Prepare the quinoa as mentioned above. Once roasted add cashew nuts and allow for it to cool. Make a powder of the two ingredients. 2. Add quinoa mix with condensed milk and butter. Mix well and microwave for 1 minute. Remove mix well and microwave for another minute. By then it must all come together into a ball. 3. Add saffron, cardamom powder and edible camphor and mix well. 4. Line a square bowl with parchment paper / foil and transfer the quinoa mix into it. Level it evenly and cut into square pieces and enjoy. Looks delicious. I am a aquinoa freak and will defintely try out this. Quinoa bar looks delicious. I have some in my hand going to try them. i just feel like grabbing that piece..looks wonderful and healthy too.. This is so good.. you have become a quinoa expert.. this is easy too..very nice :).. I love chewy burfis! I do not know if we get it here in the local supermarket. Quinoa bar looks very delicious.Will try it soon.Thanks for sharing. 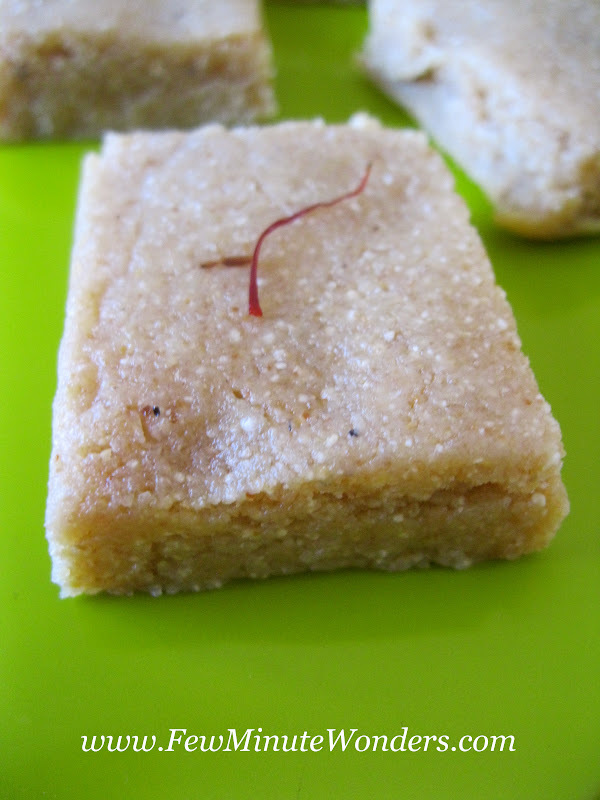 Superb n yummy bars..Never thought to prepare these with quinoa..Lovely Click! Omg, wat an incredible burfi..wish to have some now..beautiful twist..
Yummy bars,looks so delicious, thanks for sharing dear. Hi. There is an award waiting for you at my space. Do visit. Quinoa bars.......nice 1. looks delicious..nice cliks. Wow Srimathi, That looks absolutely stunning burfi. Loved it. And thank you for leaving a comment about allergy free baking. I just baked Applesauce muffins that are nut free, soy free, gluten free, vegan and gum free too. They don't look all that great but will post it just for those who do have issues. Thanks for inspiring me to think outside the box. 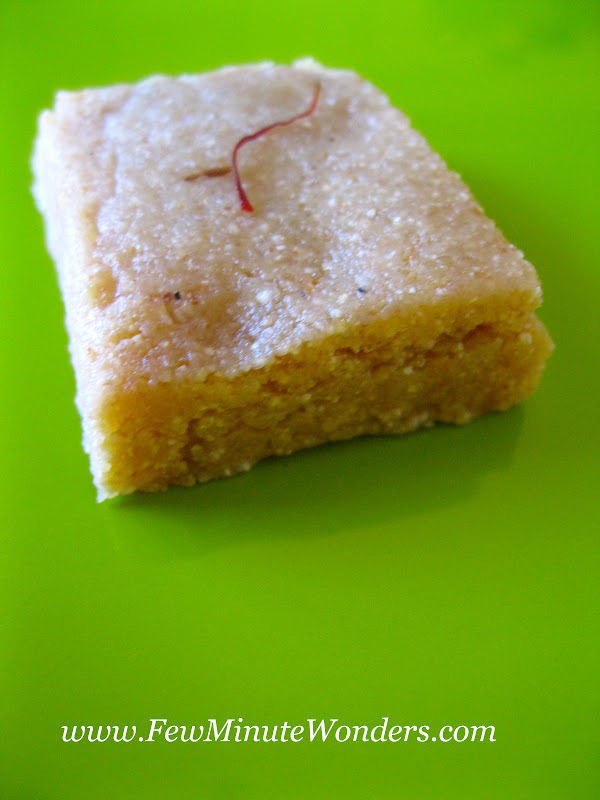 The burfi looks great, how was the texture, like badam burfis or more chewy..
Paruppu Thogayal / Lentil Chutney In 10 minutes.